The Royal Army Medical Corps was present during all engagements in the Second World War. From the frozen wastes of Norway through to liberation from the death camps of Germany and the Far East, RAMC personnel were frequently close to the front line, risking their lives to provide medical support to a mobile army in a mechanised war. The Royal Army Medical Corps was present during all engagements in the Second World War. From the frozen wastes of Norway through to liberation from the death camps of Germany and the Far East, RAMC personnel were frequently close to the front line, risking their lives to provide medical support to a mobile army in a mechanised war. Nearly 3,000 army medics were killed during the war as a result of enemy action and exposing themselves to dangerous tropical diseases. 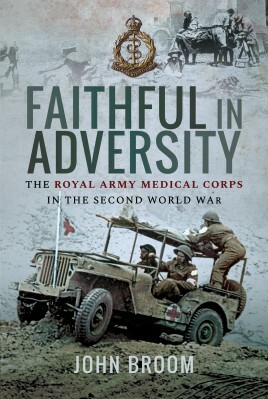 Using much previously unpublished material from public and private family archives, this book charts the story of those who remained true to the motto of the RAMC: Faithful in Adversity.